wings drift close, shadowing the light. sky covered with magic moon beams. The elementary school my daughters attended celebrated National Poetry Month in a big way. The children read and wrote a lot of verse, and Poem in Your Pocket Day was always fun, as they would pull out favorites to read to their classmates. Last year in April I posted a few of the bookmarks the school made one year with poems and artwork from the students. 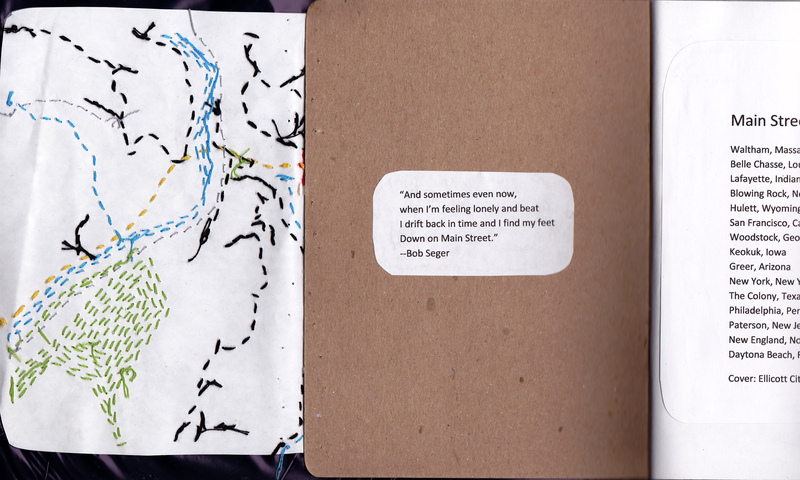 Both poem and artwork above were inspired by the bookmark below. I love the images both Kenisha and Keanu used to represent the dreamworld of the night. Both would be in their early 20s now; I hope they are still writing and drawing their worlds. And producing poems from their pockets! My poem is in the form of a san san, the challenge by Jane Dougherty this week. NaPoWriMo used this form for a prompt too, and I’ve wanted to try it, so thanks Jane for the push! Another day worth celebrating–I love maps. Useful, yet full of abstract and often mysterious beauty. 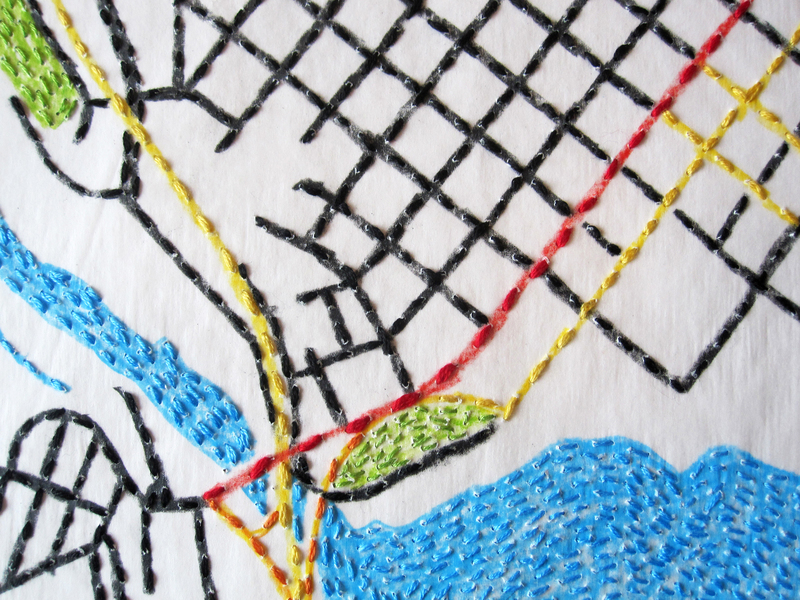 A few years ago I did a stitched map Sketchbook Project of Main Streets based on Google Maps. Google Maps are a mainstay of any traveling I do into unfamiliar territory. That softball field in Queens? It’s right there, along with the nearest subway stop. There actually is a Main Street in NYC, and I stitched it (above right), but it’s on Roosevelt Island, the entirety of which has always seemed to me to be superimposed onto the five boroughs. The Real Main Street of New York City? For almost 40 years, I’ve lived on or steps from Broadway, which travels from the bottom of Manhattan to the Bronx and 18 miles north to Sleepy Hollow. Thanks to Charlie at Doodlewash for inviting everyone to share his “month of days”. 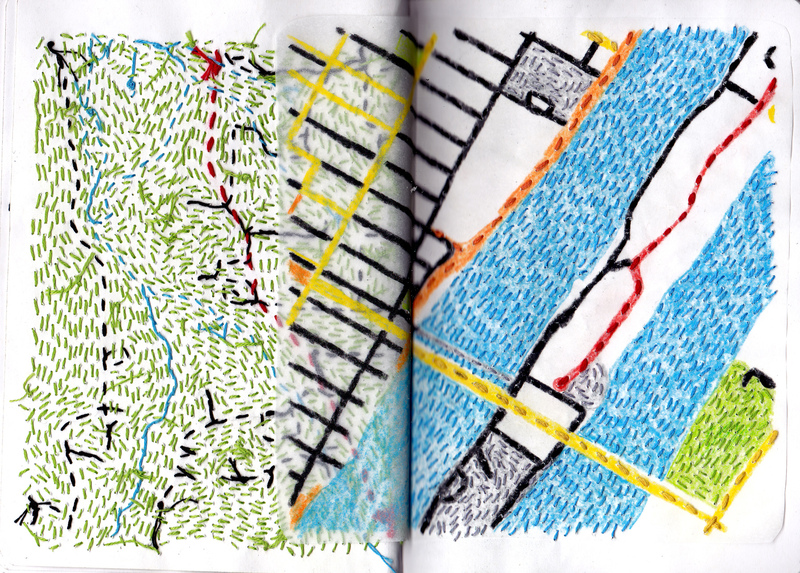 When I did my sketchbook project “Main Street”, I drew many more maps than actually fit in the sketchbook. So I’ve been mounting and stitching the ones I didn’t use in the book. Above are the first three I’ve finished. How did I decide which cities to use? It was really random. I would go to google maps and type in “Main Street” and then the name of a state, and a few suggestions for cities would pop up. Then I would randomly choose from that list, and fool around with the map until I had a layout that I liked. This will be a project with no end, which is fine. 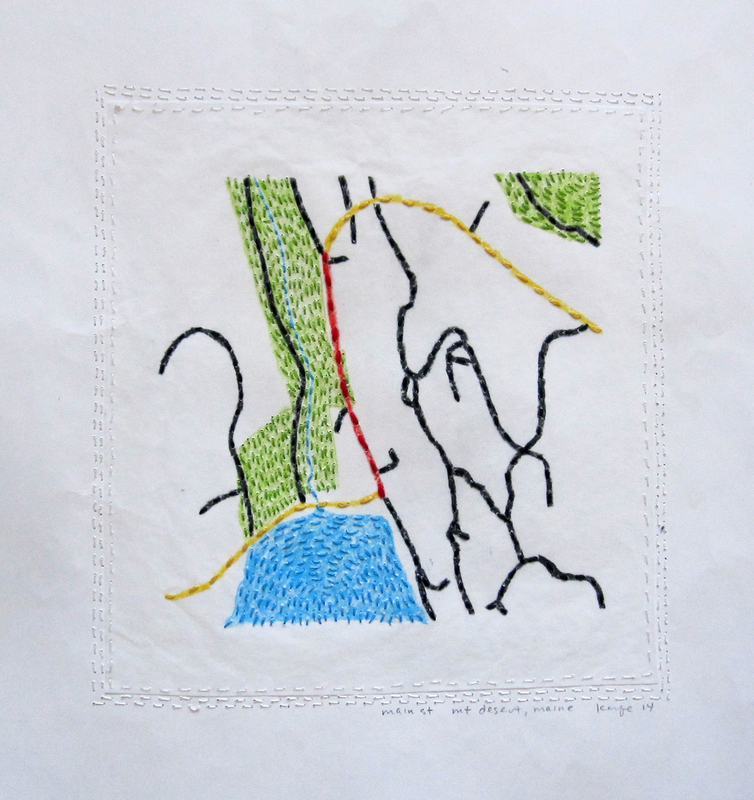 I love maps and I love embroidery. 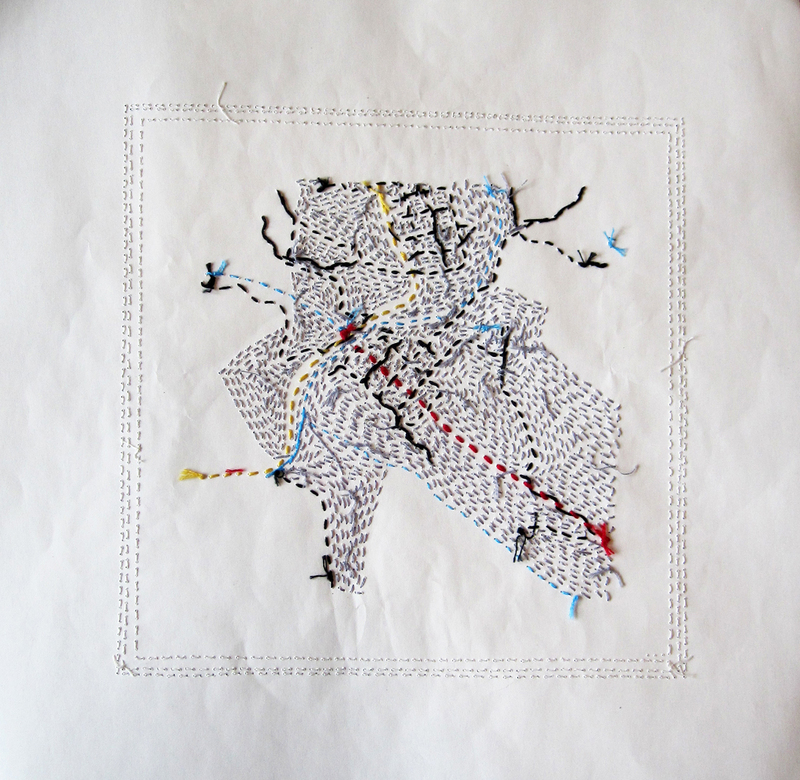 My first stitched map of country, as opposed to city, roads. I like the irregularity of it. Maps are something else I really love. Nina has done house portraits for friends (https://methodtwomadness.wordpress.com/2014/10/03/victorian-house/); I’ve been working on some map portraits to give as holiday gifts. 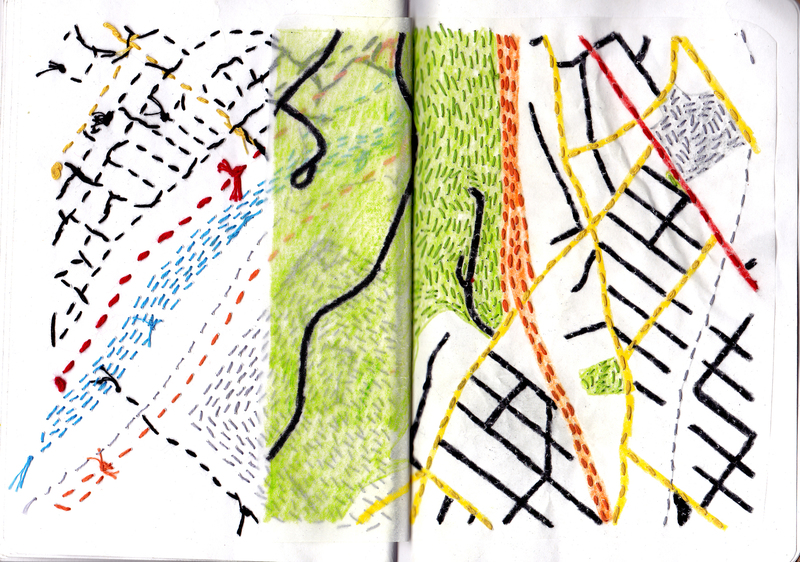 I won’t post those right now, but in honor of our home states, New Jersey and New York, here are two from my sketchbook project of stitched maps called “Main Street”. Main Street is not the most common street name in the United States (that honor belongs to Second Street), but comes in a respectable seventh. I typed “main street” and then a state name into google maps and got all kinds of interesting results. 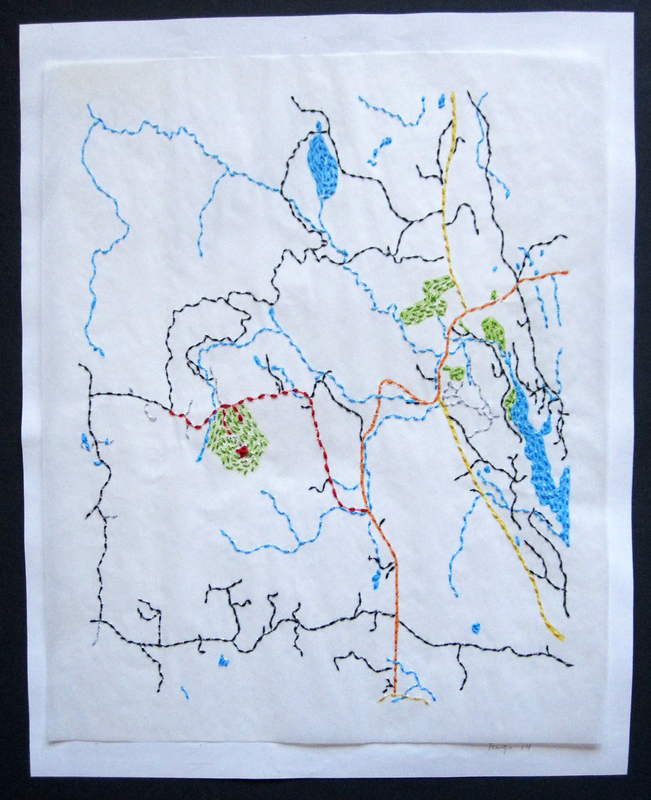 It was fun to look at the different maps, which I then abstracted and resized to fit my artistic vision. I traced them in color and stitched them. 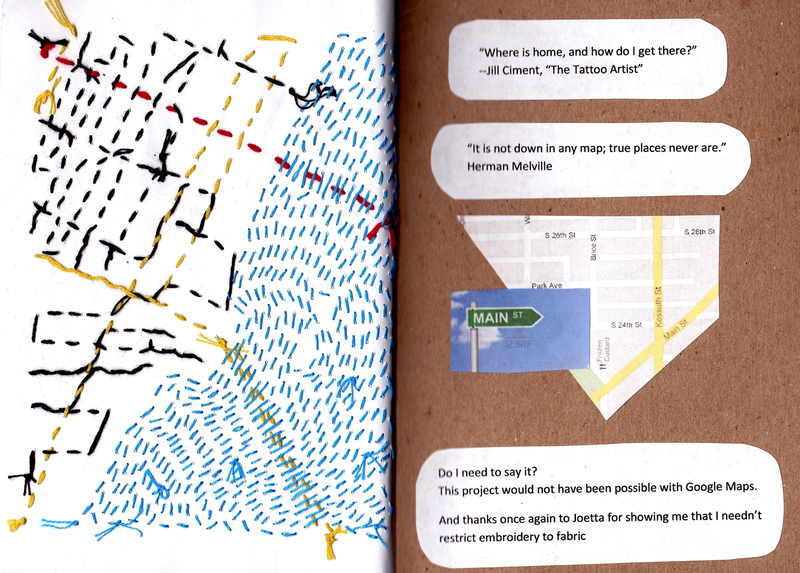 Many artists use maps as a point of reference, and many maps are beautiful pieces of art. It’s a subject that generates no end of ideas for me.